Like children, adults learn and process information differently. 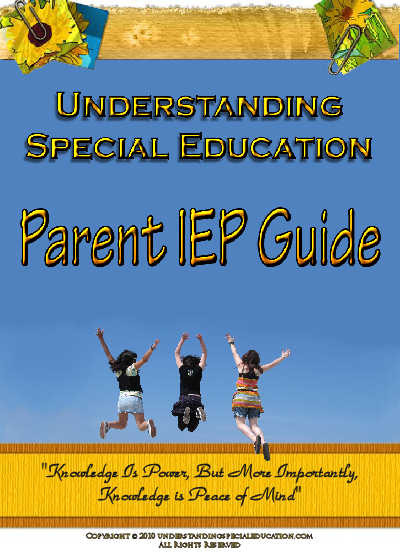 If you are the type of person who prefers to read information in a book format rather than browsing through web pages, the IEP Guide was created just for you. DOWNLOAD the PARENT IEP GUIDE directly to your computer or order the NEW hardback copy! This easy to read workbook helps you organize your child’s school information, provides you with FAQ sheets on the special education topics you’re looking for and helps prepare you for a successful IEP meeting. IEP journal to record your questions and thoughts. What is the law and what are my rights as a parent? What do I do if I don’t agree with my school? How can I ensure my child is successful? This IEP workbook can be purchased two ways. It is available by securely downloaded directly to your computer for $9.99 or for $14.99 you can purchase it printed. You can take the guide with you to IEP meetings, parent-teacher conferences or you can just have it near by if you need more information on a specific special education topics. IMPORTANT NEWS FOR PTA's, CAC's and SCHOOL DISTRICTS! The Parent IEP Guide is perfect for parent groups, special education functions or for school districts wanting to provide their special education families with this valuable information. Want to know more about SBI!? Read my review today! Thank you for visiting Understanding Special Education!